Gob-smacked. My new term for adding anything I have on my desk at the current time, onto a card. This card has been gob-smacked. These flowers were my less than stellar attempt. I had thrown them in a jar on my desk. While I was gob-smacking, I added watercolor for the flower center, backed them with a Recollections flower to finish it off. The tulle, waxed cording and old die cut leaves were also in little containers on my desk. Yes, my desk is a hazard area; but very conducive to creativity. I pulled out a container and found a package in there marked “Maggi’s Challenge.” This was dated (circa 2009). She had given me a bag full of stuff to see what I would create with it. I still had left-overs in the bag and one of the items was a sheet of plastic die cuts. Here you see a flourish that I added and brushed with a little gesso. 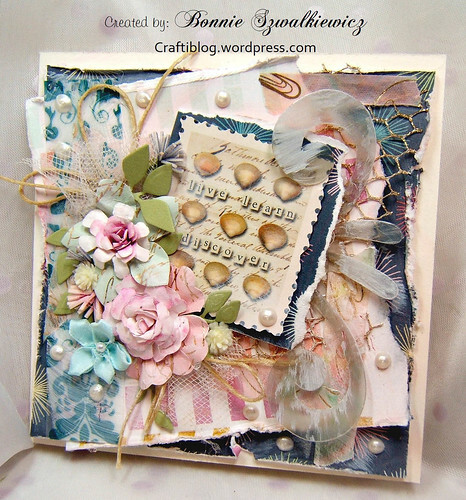 In the background you can see that I added a scrap of gold mesh ribbon, waxed cording and liquid pearls. More of the not so great flowers added to a Recollections ready made flower. I also tucked in plastic (hard) flowers; foam flowers (tiny sprays in pink or purple) and a ready made ribbon flower that were in my jar. 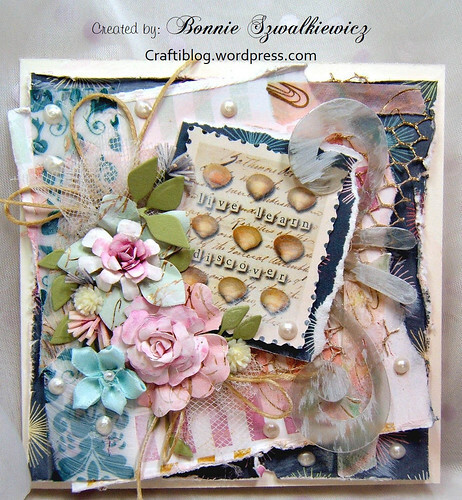 These flowers were made with a Spellbinder die set called bitty blossoms. 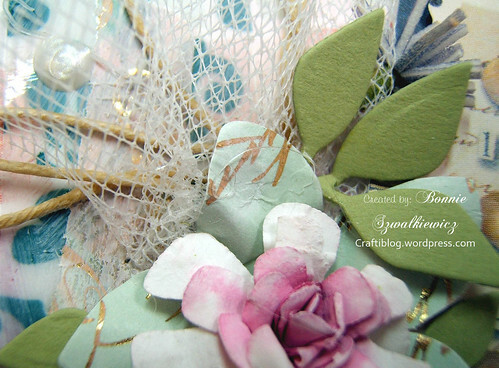 The leaves tucked in are from a Sizzix die set called Garden Greens. 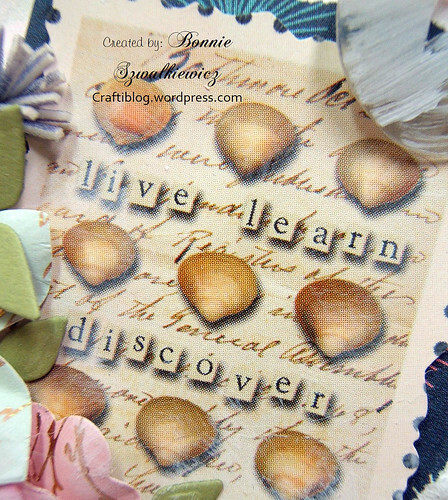 This piece was cut from a scrap of scrapbook paper and used as embellishment. And one more look at the card before you go on about your day…. What a beautiful creation! Remember you must used dies from companies carried at the Dies R Us store to qualify for the prize! Thanks so much for playing in our ‘Anything Goes DRU’ challenge at Dies R Us. Good Luck and please come back again soon! Beautiful job, well done! Thank you for playing along with us in the DIES R US challenge!